Bodie, CA – The Bodie Hills Conservation Partnership is calling on volunteers to come out and help care for the Bodie Hills on Saturday, October 8. 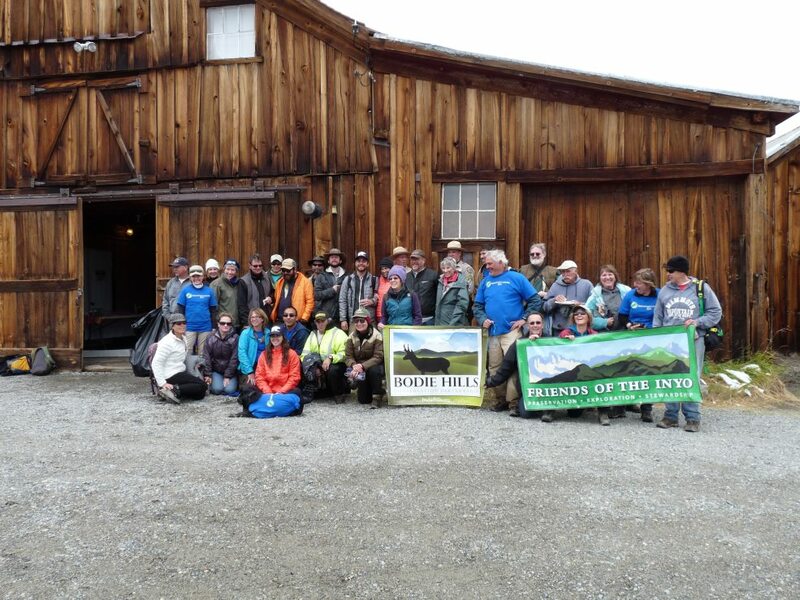 Partners for Bodie Hills Stewardship Day include Friends of the Inyo, Bodie State Park, the Bodie Foundation, and the Westin Monache Resort in Mammoth Lakes. The Bodie Hills are an American treasure with exceptional scenic, historic, and recreational values. This is a rare opportunity to help steward and enjoy the Park before it closes for the season. Volunteers will gather at Bodie State Park to help park staff with a variety of stewardship projects including: native shrub plantings, vegetation trimming around historic Bodie buildings, and non-historic fence removal. Volunteer perks include free entrance to the park, a light breakfast, lunch provided by the Westin Monache, and prizes. Following lunch, we invite volunteers on a private tour of the Bodie Ghost Town led by a State Park interpreter. Volunteers will also have a chance to meet the new Director of the Bodie Hills Conservation Partnership, April Sall. Attendees should dress in field appropriate clothes– long pants and close-toed shoes– and bring water. Gloves, tools, breakfast, and lunch will be provided. Meet at 8:30 at the Red Barn in Bodie State Park. Event goes until 1pm, followed by optional private tour of the Bodie Ghost Town. The Bodie Hills Conservation Partnership is a coalition of organizations working toward the permanent protection of the Bodie Hills, an American treasure with exceptional scenic, historic, and recreational values. We are working to create a healthy, sustainable future for the Bodie Hills that combines conservation and access, honors tradition and promotes the region’s scenic beauty.